There are so many types of Chinese pickled vegetables. If you have visited one of the larger Chinese supermarkets, you may be baffled with the array of dried or wet pickled vegetables: salt pickled, vinegar pickled, spice pickled, sweet pickled etc.. Everytime I go to those Chinese supermarkets in London I always find something I have never tried or heard before. So many to choose from and sometime I don't even know what some of them were. 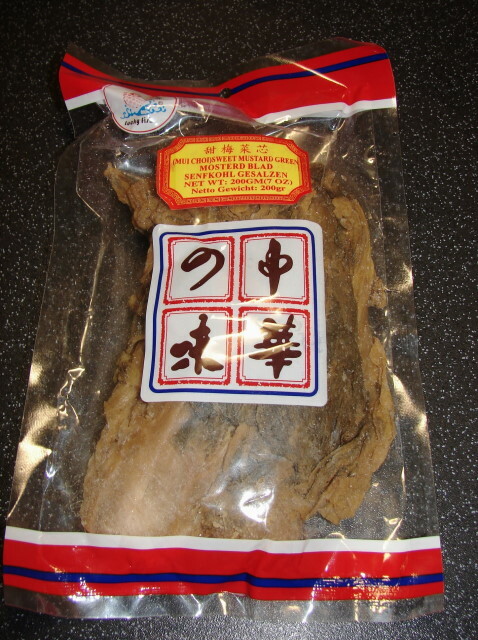 One of my favourite Chinese pickled vegetables is moi choi 梅菜 which is a brownish looking pickled mustard green. There are several kinds of moi choi, I like and normally buy the type with a hint of sweetness, normally called sweet moi choi or sweet mustard green 甜梅菜. This pickled vegetable does not look or smell appetising before cooking, kinda like dirty socks but don't be put off once cooked it is quite tasty. Today recipe is obviously with moi choi and the other star ingredient is cheap and cheerful minced or ground pork. 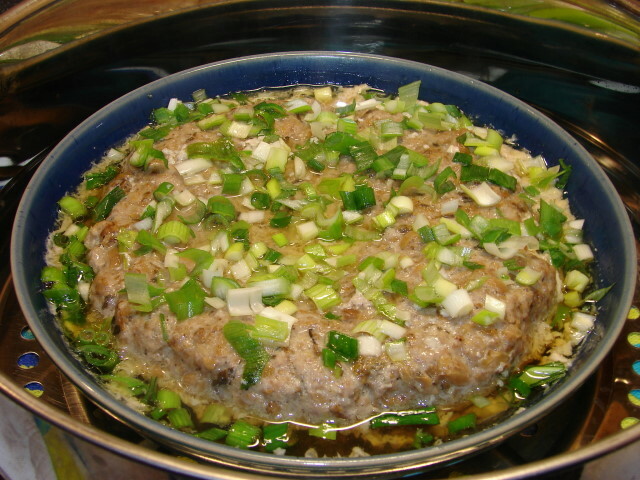 It's steamed pork cake with moi choi, in Cantonese 'moi choi jin yuk biang' 梅菜蒸肉餅. This is nothing special an everyday Cantonese home cooking. My mum used to make this quite regular since we were kids and we all loved it. Simple and easy to make. Tasty with plain rice. Mix meat with all the ingredients except moi choi and garnish. 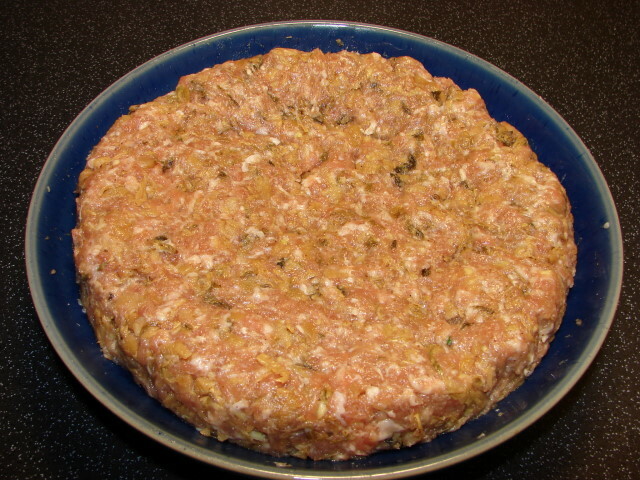 If you like a firmer textured meat cake, marinate the pork and keep in the fridge for few hours before cooking. Rinse the moi choi with several change of water to remove salt, sand and grits. Keep changing water till water is quite clear and no more gritty bits on bottom of bowl. Then using a knife and remove the woody layer outside the stem bits before chopping the moi choi as fine as possible. Put chopped moi choi in a large sieve, briefly rinse with water to remove some of the saltiness. Squeeze dry then put in a bowl and loosen. 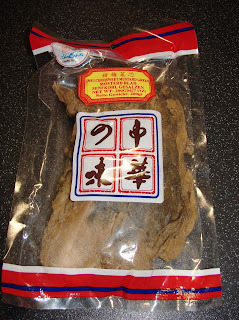 Thoroughly mix moi choi with marinated pork. Pile the meat mixture onto a deep dish. Form into a cake. Steam for about 30 - 40 minutes till meat is cooked through. Cooking time depends on thickness of meat. 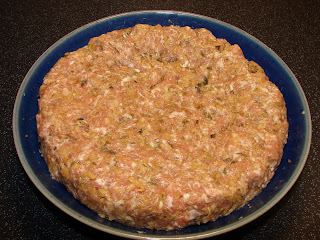 Check the centre of meat cake if it is firm inside out it is cooked. There will be quite a bit of meat juice surrounding the cake, great mixing with rice. Sometime there may be a layer of light brown custard like soft bits around the cake which I love. While it is still steamy hot, sprinkle with some spring onion and/or coriander and serve with plain rice and some steamed or stir fried vegetable. I really don’t like the “dirty socks” smell you described, but if you say it tastes good once cooked I guess I have to trust you. The pork cake looks so yummy. So I guess I know what to do next time I shop. I’ll look for the moi choi and try your recipe. Thanks for sharing it. My mother used to also make this when we were growing up. Funny though, I remember not particularly liking it. However, the older I've gotten, the more I crave the things I used to eat as a child. Wow, so happy to see this post. My Hong Kong amah used to make this when I was a girl and I have been hankering for this for a very long time. Can't wait to make it! I'm just wondering how does this taste compared with minced pork mixed with tung choy 冬菜? Tung Choi has a stronger flavour (garlicy flavour) and saltier, sweet moi choi does not have a garlicy flavour and the sweet type has a mildly sweet flavour.